I don’t know exactly when these settings were introduced in Skype, but it’s obvious that they haven’t been there in this form before Microsoft’s acquisition of Skype. The irritating thing is that one of my Skype accounts had the “Allow Microsoft to use your Skype profile information to show you more relevant ads in this application” setting enabled and I can’t remember (nor imagine) I ever knowingly allowed ad targeting. The other one is “Allow Microsoft to collect information on my behalf to make the service better” which they decided to hide in the “advanced” settings tab, although it’s clearly very privacy relevant (just read the disclaimer). 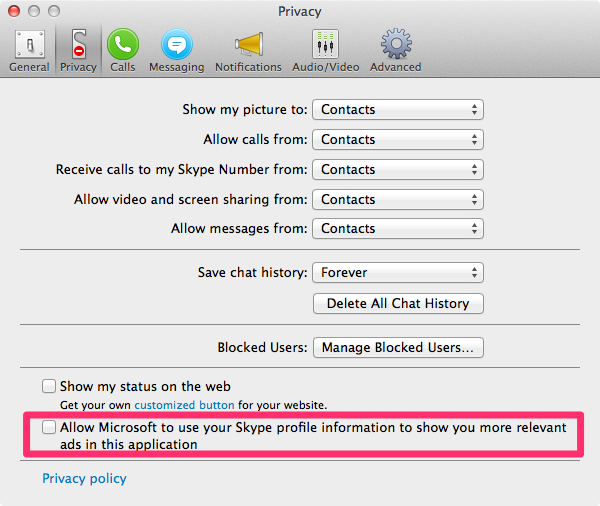 So, make sure to revise all your settings in Skype, particularly those in the privacy and advanced tabs. That’s 330 MB of private memory for each instance at this very moment! Note that these numbers are steadily growing (at about 2 KB/s) for both processes – for no apparent reason. A hint, that there’s likely a memory leak somewhere in Skype. Let’s hope Microsoft will rewrite Skype from scratch (The current code-base probably isn’t worth refactoring). I’m confident they don’t lack the human and financial resources to do it. It can only get better. 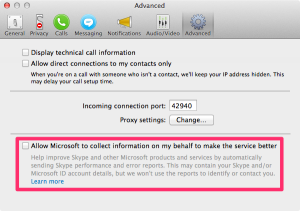 2) Create a shortcut to Skype.exe and place it on the quick launch bar. Rename the shortcut to “Skype Private Account”, for example. 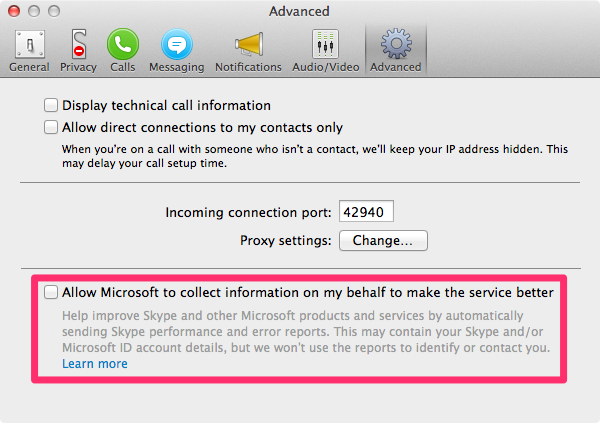 Start Skype using this shortcut and setup your first account (in this case, your private account). Rename this shortcut to “Skype Business Account” (right-click->rename). Having done this, start Skype using this shortcut. Skype will then prompt you to enter the credentials of another Skype account of yours (in this example, of your business account). You can also choose different icons for the two shortcuts. Further, I’d assume the /secondary feature isn’t limited to managing two Skype accounts, though I haven’t tested it with more than two accounts. The main advantage of this “/secondary” feature is that you don’t need to have a separate Windows user account for each of your Skype accounts. Note however that, even with this solution, a new instance of Skype will be created for each of your Skype accounts – every instance consuming about 40 MB of RAM. I think that’s a very useful feature and I like it a lot. %windir%\system32\RUNAS.exe /profile "/user:skype2" /savecred "C:\Program Files\Skype\Phone\Skype.exe"
Since this launcher doesn’t seem to use dedicated Windows user accounts on your box, you’ll have to disable Skype’s auto-login feature in order to use different Skype profiles.